The 2014 United States Grand Prix (formally the 2014 Formula 1 United States Grand Prix) was a Formula One motor race held on 2 November at the Circuit of the Americas in Travis County near Austin, Texas. It was the 17th round of the 2014 Formula One season and the 36th running of the event held as part of the Formula One World Championship. The 56-lap race was won by Mercedes driver Lewis Hamilton after starting from second position. His teammate Nico Rosberg finished second and Red Bull driver Daniel Ricciardo came in third. It was Hamilton's tenth victory of the season, his second at Austin, and the thirty-second of his career. Rosberg won the pole position by recording the fastest lap in qualifying and maintained his start line advantage on the first lap. The race was neutralised by the deployment of the safety car on the same lap when Sergio Pérez made contact with Adrian Sutil and Kimi Räikkönen, and remained out for a further three laps. During the first period of the race, Hamilton ran close behind teammate Rosberg to conserve fuel but braked heavily through certain parts of the track to prevent brake glazing. After the two Mercedes cars made their pit stops for tyre changes, Hamilton drew closer to Rosberg, passed him for the lead of the race on lap 24, and pulled away from his teammate. He remained the leader after the second round of pit stops to win. The Circuit of the Americas (pictured in 2015), where the race was held. The 2014 United States Grand Prix was the 17th of 19 scheduled rounds of the 2014 Formula One season, and the 36th running of the event as part of the Formula One World Championship. It was held on 2 November at the 5.513-kilometre (3.426 mi) twenty-turn Circuit of the Americas in Travis County, Austin, Texas. [n 1] The sport's governing body, the Fédération Internationale de l'Automobile (FIA), elected to retain two drag reduction system (DRS) activation zones from 2013: one was on the straight between turns 10 and 11, and the second was on the straight linking the final and first corners. The circuit underwent changes following the previous year's race. At the request of motorcycling's governing body, the Fédération Internationale de Motocyclisme, some sections of turn ten's asphalt run-off area were replaced by gravel and some light panels were mounted closer to the ground for improved visibility. Tyre supplier Pirelli brought two types of tyre to the race: two dry compounds (soft "options", and medium "primes"), as opposed to the previous two meetings in Austin where the Hard and Medium compounds were selected. The soft tyres were identified by a yellow stripe on their side-walls, and the medium tyres were similarly identified in white. The event's official name was the 2014 Formula 1 United States Grand Prix. Before the race, Mercedes driver Lewis Hamilton led the Drivers' Championship with 291 points, ahead of teammate Nico Rosberg in second and Daniel Ricciardo third. Valtteri Bottas was in fourth place on 145 points, and Sebastian Vettel stood two points in arrears in fifth. While the Drivers' Championship had not been won, the Constructors' Championship had been secured by Mercedes in the preceding Russian Grand Prix. Red Bull were in second place on 342 points; Williams (216 points) and Ferrari (188) contended for third place and McLaren rounded out the top five with 143 points. After spending the majority of the season behind Rosberg, Hamilton had won the season's four preceding rounds, converting a 29-point deficit into a 17-point lead over his teammate heading into Austin. With three races left in the season, Hamilton said he would prioritise not allowing any negative thoughts concerning double-points in the season-closing event in Abu Dhabi bother him and would take any opportunities he was presented with: "We've just got to do our due diligence and work as hard as we can to make sure we don't have any problems." Hamilton hoped to achieve his fifth consecutive victory of the year: "A lot of the American side of my family come to the race, plus I won the first F1 GP at the circuit back in 2012 - it's a special one for me. I really enjoy going there and I'm looking forward to another great race." Rosberg was aiming to improve on his best finish in Austin (ninth in 2013) and to further reduce Hamilton's advantage in the Drivers' Championship. He said Mercedes were targeting "a big finish" to their season, while also declaring he would not concede defeat until the final round of the season, and hoped to maintain the level of entertainment for the sport's fan base: "The first step comes in Austin, which is a really cool city and a great race track. I haven't had the best races there so far, but I'm determined to change that this year." Max Verstappen replaced Jean-Éric Vergne for the first free practice session for the second time in 2014. After both Friday practice sessions, the FIA tested for the first time a new system called the Virtual Safery Car, which is in response to minimising the risk of serious accidents and injuries, such as those suffered by Jules Bianchi at the Japanese Grand Prix. Its aim is to force drivers to reduce their speed by about 35% in an accident zone, with the aid of a dashboard display. Drivers agreed it was a worthwhile system that, however, required refinement for further testing at subsequent Grands Prix before introduction in 2015. Caterham and Marussia were each granted permission by the owner of Formula One's commercial rights Bernie Ecclestone to miss the Grand Prix after both teams were afflicted with long-term financial problems and placed into administration. This was the smallest field entered into a Formula One motor race since the 2005 Monaco Grand Prix. There were two driver changes for the first free practice session. 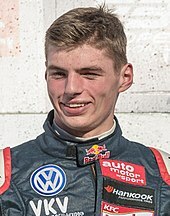 European Formula Three Championship third-place finisher Max Verstappen replaced Jean-Éric Vergne (Toro Rosso) for the second time this season, and Williams reserve driver Felipe Nasr drove Bottas's car. Three practice sessions—two on Friday and a third on Saturday—were held before the Sunday race. The Friday morning and afternoon sessions lasted ninety minutes each; the third, one-hour session was held on Saturday morning. Hamilton set the fastest time in the first practice session (which took place on an damp track which later dried up) with a lap of one minute and 39.941 seconds, although he ended his session 18 minutes early when he complained of a gear shift problem. His teammate Rosberg was second-fastest, two tenths of a seconds behind with Jenson Button third. Daniil Kvyat was fourth-fastest, ahead of Kevin Magnussen and Fernando Alonso. Vettel, Nasr, Nico Hülkenberg and Verstappen rounded out the session's top ten drivers. Ricciardo was only able to participate in the session's first 45 minutes because his energy recovery system failed and was restricted to five timed laps. In the second practice session, where it was difficult for teams to alter their car's race set-ups because of strong crosswinds, Hamilton set the fastest lap of the day at one minute and 39.085 seconds on super-soft compound tyres; Rosberg was three-thousands of a second slower in second and had the fastest time until Hamilton's lap. Both Mercedes cars had reliability concerns with Hamilton reporting another gearbox problem and his session ended early because of a minor hydraulic issue. Rosberg had an downshifting concern which he later attributed to hitting his clutch pedal after lifting his leg. Alonso was third-fastest, followed by Ricciardo, Felipe Massa (who locked his brakes lightly and later spun his car) and Kimi Räikkönen. Kvyat, Magnussen, Button and Hülkenberg followed in the top ten. Romain Grosjean and his teammate Pastor Maldonado both spun in their tight-handling Lotus cars and both drivers went off into the run-off area multiple times. Hamilton was the fastest driver in the third (and final) practice session, which was held in chilly but bright weather conditions, with a time of one minute and 37.107; Rosberg struggled with a brake issue until the session's closing minutes and went faster in the first and second sectors but an untidy final sector caused by a glazed left rear brake disc only allowed him to improve his best time by one thousand of a second and the result meant he was second-fastest. Massa was third-fastest; his teammate Bottas was fourth, Alonso fifth and Ricciardo sixth. Hülkenberg was seventh-quickest, Adrian Sutil eighth, Räikkönen ninth and Button completed the top ten ahead of qualifying. Upon switching settings on his car's steering wheel, Hamilton spun under braking at turn 12, and Rosberg ran wide at the eleventh and twelfth corners. Vergne's session was prematurely ended when his engine cut out. Nico Rosberg had the 13th pole position of his career. Following the withdrawal of the Caterham and Marussia team's two entries, minor changes were made to Saturday afternoon's three-part qualifying session. The first part ran for 18 minutes, eliminating cars that finished the session 15th or below. The 107% rule was in effect, requiring drivers to reach a time within 107% of the quickest lap to qualify. The second part of the qualifying session lasted 15 minutes, eliminating cars that finished 11th to 14th. The final part of the qualifying session determined tenth to first and the pole position. Cars in the final qualifying session were not allowed to change tyres, using the tyres with which they set their quickest lap times. Rosberg was fastest in the second and final qualifying sessions to clinch his ninth pole position of the season, his first in the United States, and the 13th of his career, with a time of one minute and 36.067 seconds. He praised the balance of his car but stated it was challenging because of changes in the track and the wind direction. Rosberg was joined on the grid's front row by teammate Hamilton who recorded a lap 0.376 seconds slower than the latter, and revealed his left front brake was 100 °C (212 °F) cooler than his right front disc, causing him to struggle, which was observed by his constant locking of his brakes in the second session. The two Williams drivers occupied the second row with Bottas ahead of Massa. RIcciardo improved greatly on his final timed lap to secure fifth place and was ahead of sixth-place qualifier Alonso. Button qualified in seventh, but took a five-place grid penalty for changing the gearbox in his McLaren. As a result, his teammate Magnussen moved into seventh. Despite improving his car's balance, Räikkönen slid several times after a front-end problem could not be rectified, creating understeer, and was restricted to starting eighth. Sutil took ninth and Maldonado, who was the fastest driver not to advance into the final part of qualifying, rounded out the top ten, but slid in turn 19, losing about two-tenths of a second, preventing him from bettering his time. Sergio Pérez used two sets of soft tyres in the first session to ensure he made the second part of qualifying and took 11th. Hülkenberg was forecast to qualify in the top ten until a tear-off visor wrapped itself around one of his front tyres entering turn 12. He had no grip, ran wide, and lost time, restricting him to qualifying 13th. Kvyat complained of tyre temperature issues after being delayed by slower traffic on his out-lap and could only muster 14th. However, he was handed a ten-place grid penalty for changing an engine component. His teammate Vergne moved into his former starting position and was the fastest driver not to enter the second session by five hundredths of a seconds. Vergne attributed this to changing to an old less powerful engine and excessive oversteer. Esteban Gutiérrez lined up in 15th ahead of Grosjean. Vettel opted to do one lap on soft compound tyres to comply with the 107% rule and took 17th. He started from the pit lane after changing his engine, his sixth of the season. ^1 — Jenson Button dropped five places on the starting grid due to a gearbox change to his McLaren. ^2 — Daniil Kvyat was demoted ten places on the starting grid due to an engine change to his Toro Rosso. ^3 — Sebastian Vettel was required to start the race from pit lane after being penalised for exceeding the season limit of five power unit component changes, by changing a sixth on his Red Bull prior to qualifying. Sergio Pérez (pictured in 2011) ended his race early after contact with Kimi Räikkönen and Adrian Sutil. The race began at 14:00 Central Time Zone (UTC-05:00). Weather conditions at the start of the race were dry and sunny with an air temperature of 23 °C (73 °F) and a track temperature between 31 to 34 °C (88 to 93 °F). 107,778 people attended the race. Every driver, bar Vettel, Kvyat and Hülkenberg, started on soft compound tyres. The trio began on the medium compound tyres. A strong cross wind cutting through the third and fifth turns caused cars to oversteer. When the race started, Rosberg made a fast getaway to maintain the lead heading into the first corner. Hamilton. who put his car at an angle towards Rosberg on the grid, maintained second position. Bottas had wheelspin off the line, enabling teammate Massa to get ahead of him. Alonso attempted to overtake Bottas for fourth heading into the second turn but reduced his speed in his attempt. Ricciardo also had wheelspin off his starting position, and fell behind both Ferrari and McLaren cars. He remained on the outside line and overtook Button and Räikkönen and attacked Magnussen, passing him driving into turn 12. Pérez glimpsed space around the inside of Sutil but the additional speed required to drive alongside the Sauber meant he slid into the rear-end of Räikkönen's car. Räikkonen was able to continue but Pérez ploughed into Sutil. As the Sauber spun, it hit Pérez for a second time; both their front wheels interlocked and their suspensions were damaged. Sutil's race ended instantly but Pérez was able to limp back his damaged Force India back to the pit lane to retire. The incident necessitated the deployment of the safety car to allow debris to be cleared from the track by trackside marshals. Both McLaren cars, Hülkenberg, Gutiérrez and Vettel made pit stops for medium compound tyres. The safety car was withdrawn at the end of the fourth lap and racing resumed with Rosberg leading Hamilton  Both Mercedes cars pulled away from Massa who fended off attempts by his teammate Bottas to retake third position. Alonso locked his rear wheels, and Ricciardo drove on the outside line before steering onto the inside lane to pass him for fifth. He narrowly avoided hitting the rear-end of Bottas's car. Alonso attacked Ricciardo and the two went alongside each other through the second corner with the Ricciardo keeping fifth by driving onto the artificial grass at the turn's exit, prompting Alonso to reduce his speed as they drove through the turn three and four switchback. Maldonado pressured Räikkönen but the latter resisted his overtaking attempts. Vergne lined up an overtake on Maldonado entering the first turn but was unable to get ahead of Maldonado. Gutiérrez lost 15th position when Vettel overtook him on the sixth lap. Vergne, Maldonado, Button and Gutiérrez were placed under investigation by the stewards for speeding behind the safety car on the following lap. The two Mercedes cars were running close behind each other with Hamilton remaining behind to conserve fuel, and observe the comparison between himself and Rosberg. The tight confines of the middle sector meant Hamilton had difficulty getting into the DRS activation zone before turn 11 and his left-front brake was 100 °C (212 °F) cooler because of him running behind the safety car. The driver braked heavily for certain corners to prevent glazing. Grosjean steered onto the outside line in an attempt to overtake Vergne for ninth place on the tenth lap but the latter drove defensively to keep the position. It was announced on the following lap that no further action was taken against Button although Vergne, Gutiérrez and Maldonado were handed five-second stop-and-go penalties which were served at their next pit stops. Ricciardo ran close behind Bottas but did not have the straightline speed to affect an overtaking manoeuvre. On lap 12, Rosberg told his team over the radio that his front-left tyre was heavily worn. Daniel Ricciardo finished third after getting ahead of both Williams drivers following their pit stops. Red Bull elected to bring Ricciardo in for his pit stop to change onto medium compound tyres on lap 14 and the Williams team did the same for Massa. The pit stop left Bottas vulnerable to being undercut by Ricciardo and his pace on the lap enabled the latter to draw alongside Massa heading towards the first turn after his pit stop. Bottas gained momentum to pass Ricciardo around the outside for fourth place. Rosberg made his pit stop from the lead on lap 15 and emerged behind teammate Hamilton in second. Bottas used DRS to attack Ricciardo entering turn 12 but the latter defended his position and did the same three corners later. Hamilton was slower than Rosberg and made his pit stop (lap 17) which saw a front wing adjustment and rejoined with a larger gap to his teammate but was now faster. Ricciardo continued to fend off the faster Bottas who got close to Ricciardo heading into turn 12. Hülkenberg lost power in his engine and his team instructed him to stop the car. He drove to the side of the track on the backstraight to retire on lap 18. Alonso overtook Vettel to move into ninth on the following lap. Gutiérrez left space for Grosjean who braked later than him and passed him for 12th place at turn 12 with Vergne following through. Hamilton gained on Rosberg enough to use DRS by lap 22. On the following lap Hamilton lined up a pass on his teammate on the back straight but did not get ahead. On lap 24, Rosberg selected a setting intended to provide him with additional power to defend against Hamilton of which he did not receive. Hamilton slipstreamed Rosberg on the backstraight, used DRS, and drove alongside his teammate going into turn 12. Rosberg attempted to defend his position but Hamilton steered to the inside of him to overtake him for the lead. Hamilton forced Rosberg onto the turn's run-off area and both drivers narrowly avoided a collision as Hamilton began to pull away from his teammate. Alonso batted Button over the previous two laps and overtook him around the outside for seventh place on that lap. Vergne attacked Grosjean on lap 25 after the latter could not overtake Vettel's slower car. Grosjean tried again on the following lap and passed Vettel for ninth at the first turn. Alonso moved into sixth after overtaking Magnussen with a switchback manoeuvre at the first corner. Button lost eighth and ninth positions after Grosjean and Vergne passed him over the next two laps and Button made a pit stop for medium compound tyres on lap 29. Massa kept within a reasonable gap between the two Mercedes cars and established a 2.4 second advantage over Ricciardo. Williams elected to make a pit stop for Bottas at the end of the 30th lap for medium compound tyres and Ricciardo responded by demonstrating quick pace to go seven-tenths of a second faster than Bottas in the final sector. Ricciardo made his pit stop on the following lap and emerged in front of Bottas. He began matching Massa's pace before the latter made his stop on lap 32 which proved problematic: his mechanics were delayed for one second when they were installing one of Massa's front tyres, allowing Ricciardo into third position. Hamilton entered the pit lane from the lead on the 33rd for his second (and final) stop and rejoined behind teammate Rosberg in second. Rosberg was informed by his team to increase his pace and led the field on the 34th lap before making his pit stop, handing the place back to Hamilton. Grosjean was passed by Vettel for tenth position on lap 37 and drew close to Magnussen shortly after. He overtook Magnussen around the outside three laps later but was unable to slow sufficiently and the latter reclaimed the position. Lewis Hamilton took the thirty-second victory of his career, becoming the most successful British driver in Formula One history. Maldonado was issued with a five-second stop-and-go penalty on lap 41 for speeding in the pit lane. Button shadow boxed Grosjean for eleventh on the same lap but was unable to force him to run wide and overtake him on the outside line. He managed to get past Grosjean by going around the outside of him on lap 42. Vettel out-braked Magnussen to take over ninth place on the lap. Alonso made a pit stop for soft compound tyres on lap 43 and emerged in seventh behind Vettel. He immediately became involved in a three-way battle between Vettel and Magnussen for sixth to eighth. Vettel was not happy with the handling of his car because his tyres were worn and Alonso passed him with DRS to retake sixth place on lap 46. Rosberg went half a second quicker than teammate Hamilton to be 1.9 seconds adrift of his teammate at the start of the next lap and Hamilton was cautioned over the radio to be cautious about tearing up a piece of artificial grass which became dislodged at the turn 19 exit. As Rosberg attacked to further reduce the gap, Hamilton went quicker to extend his lead by four-tenths of a second. Massa was told by his team to reduce the deficit to Ricciardo and responded by going half a second quicker than Ricciardo on lap 49. Vergne and Grosjean made contact at turn one with the former getting past around the inside for ninth position on lap 50. Maldonado took advantage of this and overtook his teammate Grosjean to claim tenth. On lap 52, Kvyat made an error, allowing Räikkönen to pass him. Vettel passed Räikkönen for 12th position on the next lap and immediately caught slower traffic. Button lost eighth to Vergne on the lap and fell behind Vettel on lap 54. Vettel made up further ground by overtaking Vergne for ninth on the next lap. Hamilton was delayed by slower traffic, reducing his lead to 2.1 seconds when the final lap began, but his teammate Rosberg was also baulked, allowing Hamilton to maintain the lead and win the race. Rosberg finished second, 4.3 seconds behind with Ricciardo third. He was 1.3 seconds in front of the fourth-placed Massa with his teammate Bottas fifth. Alonso, Vettel, Magnussen, Maldonado finished in positions sixth to nine. Vergne rounded out the top ten after being handed a five-second time penalty for the contact with Grosjean. Grosjean, Button, Räikkönen, Gutiérrez and Kvyat were the last of the classified finishers. It was Hamilton's tenth win of the season, his second in Austin, and the thirty-second of his career, surpassing Nigel Mansell's record for the most victories of any British driver in his career. [n 3] Hamilton also became the first British driver since Mansell to secure five successive wins. There were five lead changes in the race; two drivers reached the front of the field. Hamilton led three times for a total of 33 laps, more than any other driver. At the podium interviews, conducted by former driver Mario Andretti, Hamilton spoke of his gratitude to be at the front of the field and that it was "such a privilege" for his country to be represented and praised his car. Rosberg revealed it took him some time to find a rhythm he liked but had only found it when Hamilton passed him. Ricciardo thanked his team for providing him with a car that allowed him to contend for a podium position and was "really happy" to secure third place. He stated that "we all had a great weekend" and that his race was not "too boring". In the later press conference, Hamilton said upon passing Rosberg, he controlled the pace by managing tyre wear, and that while brake locking persisted, it did not hinder him. Rosberg stated there were no lasting problems after driving over the track's kerbing but was fully committed to pressuring his teammate in an attempt to draw closer to him but that it was not possible to overtake him. 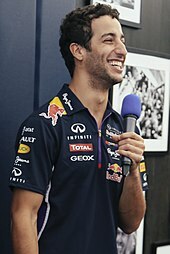 Ricciardo said he felt his team's strategy enabled him to get ahead of the Williams cars and believed he was at fault for his slow start off the line although he aimed to rectify the problem before the Brazilian race. Jean-Éric Vergne (pictured in 2012) was demoted to tenth for colliding with Romain Grosjean and was handed one super licence penalty point. Along with his five-second time penalty for forcing Grosjean off the track, Vergne was handed one penalty point on his super licence, his third of the season. Vergne said in the race's closing period, he wanted to move up the field, and perceived the contact with Grosjean as part of motor sport. Grosjean stated it was "really frustrating" not to finish in the top ten, and revealed the collision with Vergne damaged his car's front wing and floor, making it difficult to control for the remainder of the Grand Prix. For the contact with Sutil and Räikkonen, Pérez was issued with a seven-place grid penalty for the Brazilian Grand Prix and two penalty points on his super licence. Pérez described the situation as "unfortunate" and had not anticipated Räikkönen being in the place that he was. Sutil was frustrated over the crash which prevented him from achieving Sauber's first points of the season, describing it "such a shame and so disappointing" and called the incident "unnecessary": "We were hoping for a great result today and because of a silly action like this we missed everything." Räikkonen expressed his dislike of the situation he found himself in during the race with a three pit stop strategy and complained of heavy front tyre degradation and excessive understeer. He informed the press that neither he nor his team identified the source of the problem but appreciated assistance: "To try and drive slowly in certain places didn't make any difference so I don't understand it really. Wherever we finished it's pretty disappointing. Not being able to solve certain issues is frustrating. Hopefully something comes up and we find what the issues are." Similarly, Alonso complained his car had severe tyre vibrations in the final two laps, reducing his visibility: "I tried to control the pace. I was asking for a gap from behind to cross the line just in front of them. But then Vettel overtook [Kevin] Magnussen and there was no time to save any more so on the last lap I was flat out with huge vibrations." The Williams performance chief Rob Smedley suspected minor issues including Massa's slow pit stop prevented his team from finishing on the podium but praised Ricciardo's performance. Red Bull team principal Christian Horner explained that Vettel's first lap pit stop for medium compound tyres was performed with the intention of not using soft tyres for the rest of the race. The result meant Hamilton increased his lead over Rosberg in the Drivers' Championship to 24 points. Ricciardo remained in third position but his third-place finish meant he became mathematically excluded from winning the Drivers' Championship, enabling only Rosberg and Hamilton to remain in contention for the title. Bottas moved a further four points clear of Vettel to establish his hold on fourth place. Mercedes further extended their unassailable lead in the Constructors' Championship to 245 points in front of second-placed Red Bull. Williams and Ferrari remained in third and fourth positions and McLaren maintained fifth on 147 points with two races left in the season. ^4 — Jean-Éric Vergne originally finished ninth, but had five seconds added to race time for making contact with Romain Grosjean while overtaking him. ^ The race had been provisionally scheduled for 9 November, however, the date coincided with a University of Texas American football team game, which would have strained Austin's tourism infrastructure. ^ It was noted by several publications that a boycott would have been similar to the 2005 United States Grand Prix at Indianapolis Motor Speedway where six drivers took part after cars equipped with Michelin tyres withdrew on safety grounds and would reverse the positive reputation the sport had established in the country along with further damaging relations with the low-budget teams. ^ Hamilton had previously won in the United States at Indianapolis Motor Speedway in 2007 while driving for McLaren. ^ Vertuno, Jim (4 December 2013). "2014 calendar has F1 and NASCAR in Texas same day". The San Diego Union-Tribune. Associated Press. Archived from the original on 11 June 2017. Retrieved 11 June 2017. ^ a b c "Race Preview: 2014 United States Grand Prix" (PDF). Fédération Internationale de l'Automobile. 29 October 2014. Archived (PDF) from the original on 10 June 2017. Retrieved 28 May 2017. ^ "United States GP retains two DRS zones". GPUpdate. 26 October 2014. Archived from the original on 29 October 2014. Retrieved 28 October 2014. ^ a b Rowlinson, Anthony. "US Grand Prix stats". F1 Racing. 226 (December 2014): 116. ^ "2014 Formula 1 United States Grand Prix". Formula1.com. Archived from the original on 20 September 2014. Retrieved 28 May 2017. ^ a b "Hamilton keeping focus". Telegraph & Argus. Press Association. 13 October 2014. Archived from the original on 12 June 2017. Retrieved 12 June 2017. ^ Baldwin, Alan (29 October 2014). "Hamilton aims to make it 10 in Texas". Reuters. Archived from the original on 10 June 2017. Retrieved 28 May 2017. ^ Hensby, Paul (28 October 2014). "Nico Rosberg: "I wont be giving up the fight"". The Checkered Flag. Archived from the original on 1 December 2014. Retrieved 28 May 2017. ^ "F1 to trial virtual safety car at US Grand Prix". Zee News. Asian News International. 1 November 2014. Archived from the original on 10 June 2017. Retrieved 28 May 2017. ^ "US GP should be more exciting this year – Alonso". ESPN. 31 October 2014. Archived from the original on 13 January 2015. Retrieved 28 May 2017. ^ Parkes, Ian (27 October 2014). "F1: Marussia placed into administration and will join Caterham in missing United States Grand Prix". The Independent. Press Association. Archived from the original on 10 June 2017. Retrieved 28 May 2017. ^ a b Anderson, Ben (31 October 2014). "United States GP: Lewis Hamilton edges Nico Rosberg in FP1". Autosport. Archived from the original on 1 November 2014. Retrieved 28 May 2017. ^ a b Johnson, Daniel (1 November 2014). "US Grand Prix 2014: Lotus, Force India and Sauber all threaten to boycott race as F1 enters financial turmoil". The Daily Telegraph. Archived from the original on 11 February 2017. Retrieved 7 June 2017. ^ a b c Baldwin, Alan (1 November 2014). "F1 teams play down talk of U.S. GP boycott". Reuters. Archived from the original on 10 June 2017. Retrieved 7 June 2017. ^ a b Olson, Jeff (1 November 2014). "Could three teams boycott Formula 1 U.S. Grand Prix?". USA Today. Archived from the original on 4 November 2014. Retrieved 7 June 2017. ^ Noble, Jonathan (8 November 2014). "Force India F1 boss Vijay Mallya denies boycott was threatened". Autosport. Archived from the original on 8 November 2014. Retrieved 7 June 2017. ^ "Hamilton fastest in opening Austin practice". GPUpdate. 31 October 2014. Archived from the original on 7 November 2014. Retrieved 7 June 2017. ^ Weaver, Paul (31 October 2014). "Lewis Hamilton fastest in F1 practice for US GP despite gear problem". The Guardian. Archived from the original on 15 October 2015. Retrieved 7 June 2017. ^ Benson, Andrew (31 October 2014). "Lewis Hamilton fastest in United States GP practice". BBC Sport. Archived from the original on 14 August 2016. Retrieved 7 June 2017. ^ Galloway, James (31 October 2014). "2014 U.S. GP Practice One: Lewis Hamilton starts strongly in Austin to set the pace". Sky Sports F1. Archived from the original on 10 June 2017. Retrieved 7 June 2017. ^ a b c Esler, William (31 October 2014). "2014 U.S. GP Practice Two: Lewis Hamilton stays narrowly ahead of Nico Rosberg". Sky Sports F1. Archived from the original on 10 June 2017. Retrieved 7 June 2017. ^ a b Straw, Edd (31 October 2014). "US GP: Lewis Hamilton pips F1 title rival Nico Rosberg in practice". Autosport. Archived from the original on 21 March 2015. Retrieved 7 June 2017. ^ a b Benson, Andrew (1 November 2014). "Lewis Hamilton dominates final United States GP practice". BBC Sport. Archived from the original on 16 August 2016. Retrieved 7 June 2017. ^ a b c Straw, Edd (1 November 2014). "US GP: Lewis Hamilton fastest in practice, Nico Rosberg troubled". Autosport. Archived from the original on 21 March 2015. Retrieved 7 June 2017. ^ a b Galloway, James (1 November 2014). "2014 U.S. GP Practice Three: Hat-trick for Hamilton as he moves clear of Rosberg". Sky Sports F1. Archived from the original on 18 September 2015. Retrieved 7 June 2017. ^ a b "Qualifying format revised due to Caterham, Marussia absence". Formula1.com. 30 October 2014. Archived from the original on 30 October 2014. Retrieved 30 October 2014. ^ "Rosberg breaks Hamilton stranglehold for US pole". Yahoo! Sports. Agence France-Presse. 1 November 2014. Archived from the original on 17 October 2015. Retrieved 7 June 2017. ^ a b Benson, Andrew (1 November 2014). "Nico Rosberg beats Lewis Hamilton to United States GP pole". BBC Sport. Archived from the original on 16 August 2016. Retrieved 7 June 2017. ^ a b c d e f g h i j Straw, Edd (1 November 2014). "US GP: Nico Rosberg beats Lewis Hamilton to Austin Formula 1 pole". Autosport. Archived from the original on 21 March 2015. Retrieved 7 June 2017. ^ a b Esler, William (1 November 2014). "2014 U.S. GP Qualifying: Nico Rosberg takes pole position by nearly four tents". Sky Sports F1. Archived from the original on 7 January 2016. Retrieved 7 June 2017. ^ "F1 United States Grand Prix: Button: We won't be as quick as in Sochi". crash.net. 31 October 2014. Archived from the original on 13 November 2014. Retrieved 7 June 2017. ^ a b c d e "Qualifying – selected team and driver quotes". Formula1.com. 1 November 2014. Archived from the original on 2 November 2014. Retrieved 7 June 2017. ^ a b c "2014 United States Grand Prix – Qualifying results". Formula1.com. Formula One World Championship Limited. 1 November 2014. Archived from the original on 1 November 2014. Retrieved 1 November 2014. ^ "GP USA in Austin / Rennen". motorsport-total.com (in German). Archived from the original on 4 November 2014. Retrieved 7 June 2017. ^ Spurgeon, Brad (3 November 2014). "Formula One Visits the U.S., and the Results Are the Same". The New York Times International Edition. Archived from the original on 10 June 2017. Retrieved 7 June 2017. ^ a b c d e f g h i j k l m n Hughes, Mark (3 November 2014). "2014 United States GP report". Motor Sport. Archived from the original on 10 January 2015. Retrieved 7 June 2017. ^ a b c d e f g h i j k l m n o p q r s t u v Freeman, Glenn; AUTOSPORT Staff (2 November 2014). "As it happened: Sunday – US Grand Prix". Autosport. Archived from the original on 4 November 2014. Retrieved 7 June 2017. ^ a b c d e f g h i j k l m n o p q r Barretto, Lawrence (2 November 2014). "United States GP as it happened". BBC Sport. Archived from the original on 23 August 2016. Retrieved 7 June 2017. ^ a b c d e f g h i j k l m Bagchi, Rob (2 November 2014). "Lewis Hamilton wins the United States Grand Prix 2014: Formula One as it happened". The Sunday Telegraph. Archived from the original on 24 February 2017. Retrieved 7 June 2017. ^ Esler, William (2 November 2014). "2014 United States GP – driver reaction". Sky Sports F1. Archived from the original on 18 September 2015. Retrieved 8 June 2017. ^ "Rosberg blames ERS error for US fail". Wheels24. Agence France-Presse. 3 November 2014. Archived from the original on 7 November 2014. Retrieved 9 June 2017. ^ a b c "Penalty for Grosjean clash drops Vergne to 10th". ESPN. 3 November 2014. Archived from the original on 4 January 2015. Retrieved 10 June 2017. ^ a b The Sports Network (2 November 2014). "Hamilton moves closer to F1 title with U.S. GP win". United Press International. Archived from the original on 10 June 2017. Retrieved 9 June 2017. ^ "Lewis Hamilton Thanks Fans, Flag Power as Title Looms". NDTV. Associated Press. 3 November 2014. Archived from the original on 10 June 2017. Retrieved 9 June 2017. ^ a b Weaver, Paul (2 November 2014). "Lewis Hamilton wins F1 US Grand Prix to extend his championship lead". The Guardian. Archived from the original on 6 May 2015. Retrieved 10 June 2017. ^ a b "2014 United States Grand Prix". Racing-Reference. Archived from the original on 10 June 2017. Retrieved 28 May 2017. ^ "2014 United States Grand Prix – Race Press Conference". Fédération Internationale de l'Automobile. 2 November 2014. Archived from the original on 5 May 2017. Retrieved 9 June 2017. ^ Smith, Luke (3 November 2014). "Vergne penalized for clash with Grosjean in Austin". NBC Sports. Archived from the original on 2 June 2016. Retrieved 10 June 2017. ^ "F1 Brazilian Grand Prix: Grosjean frustrated by Vergne clash". crash.net. 4 November 2014. Archived from the original on 5 November 2014. Retrieved 10 June 2017. ^ a b c Anderson, Ben (3 November 2014). "US GP: Sergio Perez punished for 'reckless' crash with Adrian Sutil". Autosport. Archived from the original on 3 November 2014. Retrieved 10 June 2017. ^ a b Hynes, Justin (3 November 2014). "Ferrari's troubles continue as team fires blanks in Austin shootout". James Allen on F1. Archived from the original on 6 May 2016. Retrieved 10 June 2017. ^ Anderson, Ben (4 November 2014). "'Small things' cost Williams F1 team a podium in US Grand Prix". Autosport. Archived from the original on 4 November 2014. Retrieved 10 June 2017. ^ Noble, Jonathan (3 November 2014). "F1 USGP: Low-downforce set-up hurt Sebastian Vettel in traffic". Autosport. Archived from the original on 4 November 2014. Retrieved 10 June 2017.